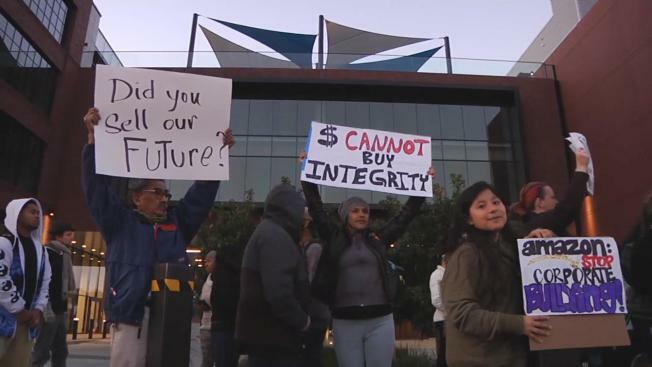 People gathered in East Palo Alto on Thursday evening for a protest in the form of a vigil over Amazon's planned office in the Peninsula city. The office is set to open later this year, but residents are not happy given that locals aren't being hired by the retail giant. East Palo Alto policy states that new companies moving in are required to at least try to hire 30 percent of their employees from the city. Critics say Amazon isn't doing enough to meet that requirement. City Manager Carlos Martinez said the policy has worked for retail jobs. But it's unlikely to work for Amazon because the company is looking for high-tech workers, and just 16 percent of locals have the college education needed to fill those jobs. Amazon will devote a specialist to help people in the community find jobs.